Dimensions: 165mm front to back on surface rack rails (overall length), 130mm from canti mounting bolt to surface rack rails, overall height apprx 250mm from canti mountings to top of rack. Weight 290g. ProsQuality , easy to fit . The SJS front rack is the second one I've fitted to one of my bikes . The first one was Chinese , and cost 1/3 the price , I had to bend the two brake boss supports and make a bracket for the crown support , the quality was poor , The SJS fitted straight on and the quality was much better . The SJS was far better and worth every penny . I bought this after breaking two cheap racks purchased elsewhere. I looked at lots of options, but there are few affordable front racks that mount in this manner - especially in black. I am very pleased with the quality of this rack. The construction is immediately superior to my previous racks and is extremely sturdy. Highly recommended! Very good front rack.very solid when fitted. ProsNeat and compact. Seems well finished. This is a very neat little rack. I was pleased that it fit onto the brake bosses without affecting the operation of my fork mounted B&M bottle dynamo. I needed to add a couple of washers between brake bosses and the rack flanges to avoid the bracket fouling the brake action. The one problem I had in fitting it was that the bracket for attaching the rack to the fork crown was much too short for me and I had to make a new, longer bracket from a piece of mild steel. Arrived promptly from SJS. Easy to fit, but you do need a couple of additional washers to go between the rack feet & the brake bosses to stop them binding. Minor adjustment required for brakes afterwards but then good to go & rock solid since. Fitted to take an SKS wicker basket on a hybrid with 80mm suspension forks - attached with 4 x cable ties & looks neat. Basket sits much lower than the handlebar mounted basket it replaced. Lights can go back in the handlebar, rather than bouncing around on the lip of the basket - much better. Actually this is second time I bought this as first time it interfered with my crown fitting dyno light. After buying the Hebie rack adaptor I was able to fit this and dyno light on. Great rack for the money, you really can't go wrong with this for only £16. Pretty straightforward to fit and it feels solid and dependable. Perfect for lugging locks around and balancing weight between the front and back of my bike. There is no braze on for attaching a front light (as on some nitto racks) but for less than a third of the price, I'm not complaining. Prosgood price, well made, easily fitted. Small, easily fitted to v brake bosses and down tube. Well made and functional. Weight limit of 6kgs. Ideal addition to carry big and bulky items (sleeping bags) freeing up space in the panniers. I wanted a small front rack for my long distance tours. A bit fiddly to fit but it is well made. Has a weight limit but it is only intended for small items. Will this fit onto a Raleigh parkway. 20 inch wheel size I think. Unfortunately as we do not stock that particular bike we cannot say whether this will work or not as we have no way of testing it im afraid. Although you may need a different bolt and make some small adjustments you should be able to fit this onto a Sherpa without too many issues. Would It Fit On The Rear As A Saddle Bag Support? Unfortunately due to the positioning of the fittings it would not work on the rear of the bike. What Is The Max Weight Limit Of The Rack? Is It Suitable For Handlebar Bags? 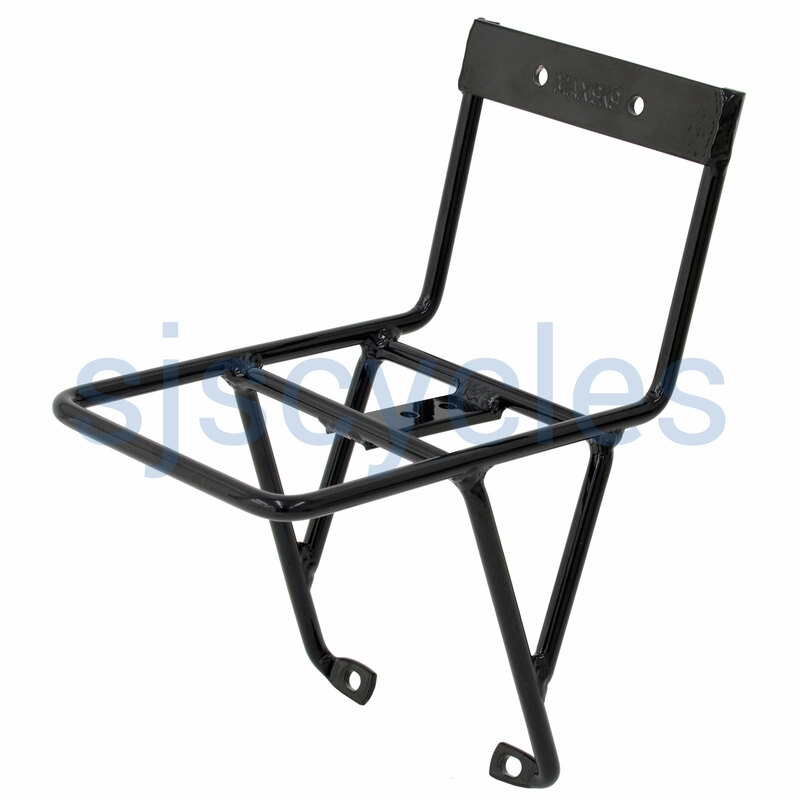 Unfortunately we don't have a manufacturer specified weight limit, but we assume that the weight limit due to the size and construction of the rack will be around 3-4kg. This would sit quite low compared to the handlebars so may not be suitable for use with handlebar bags. Will Fitting The Rack Beneath Cantilevers Get In The Way Of The Spring Holes On The Bosses? Traditional cantilevers with springs that slot into holes on the bosses. You are correct, I was mistaken in my previous reply as i confused this product with a different one. The bolts that fit the brakes to the forks have to pass through this rack before then passing through the brakes and into the forks. This may well require longer bolts. What Is The Distance Between Brake Studs And Fork Crown Mount? I would like to mount it on a 20 " (451mm) bicycle but I'm afraid the fork is too short. The stud mountings are 80mm apart and the crown mounting is 110mm above them. Hi What Is The Max/Min Distance Between The Brake Boss Holes? This would be right on the limit, but you should be able to use this rack with fork bosses that are 75mm apart. Spacing Between Holes On Brake Mounting Tangs ? The cente to centre spacing between my brake bosses is 80 mm. Can you confirm the mounting tangs on this carrier will fit ? Yes, the centre to centre spacing on this rack is 80mm, so it will fit your bike fine. Does This Mount Ok On V Brakes? Yes, this rack can be mounted to a bike with V-brakes. Alloy Front Carrier, What Mounting Hardware Is Included? Does it come with mounting hardware for fixing to the brake bosses? If it will not fit my Thorn Raven Tour please let me know. If you bike is just a Raven Tour and not a Raven Sports Tour then it will fit fine. The carrier comes with everything that is pictured in the first picture, fixing bolts for the crown mounting but none for the brake boss mounting.